Everyone wants to know if they are earning what they are worth. Part of earning is learning, so you might be wondering if you should you go for another certification. Will it help you earn more in the future? Should you change specialties, or maybe move to another part of the country? A top notch recruiter who specializes in your industry is a great resource for these questions. We help actuaries evaluate these variables when they are considering a job change or planning their career path. Of all the professions, actuaries are among the most savvy. Risk and reward are part of their daily lives. That’s why we chose to create query tools that would work the way they would like them to. Our 2015 survey results offer new insights into actuarial compensation; and we, above all others, offer a more comprehensive views of the industry. More participants and more data give us better results to offer. 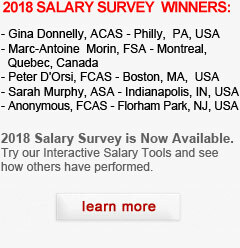 Would you like to know the average base salary for Property Casualty actuary in the Southeast, or your region of the country? How about the trends in specialization or compensation? How to you stack up? Find out here. http://www.actuarialcareers.com/2015interactive-tool-new.php.